No scare tactics, just straight talk and the information you need. What is it and is color an indicator? What if you find out you have Stachybotrys? Q: What is it? What is black mold, toxic black mold and the combo toxic black Mold? Answer: All of the terms listed above are media terms and not mycology or laboratory terminology. You will not find “Black Mold” in reference books or medical dictionaries. However, we know what you are talking about when you ask about the BLACK mold. 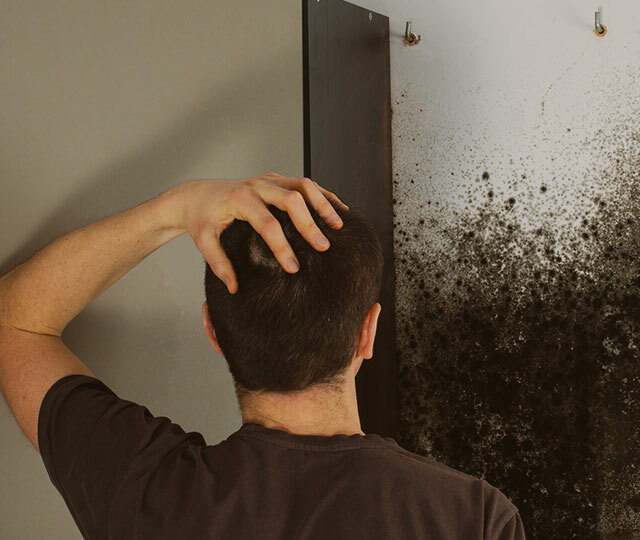 Usually when a customer asks about Black mold, what he/she is referring to is the genus of mold called of Stachybotrys. Stachybotrys was given the common name “BLACK mold” back in the late 1990s and early 2000s during the heavy media coverage of infant deaths. The media reported that infants died from lung hemorrhages from exposure to Toxic Black Mold, Stachybotrys. Stachybotrys is a greenish-blackish mold that grows well on cellulose containing materials. Cellulose is wood, so things like paper, lumber, paper backing on sheetrock, fiberboard and some textiles etc. are frequent sources of contamination indoors. Q: Is Color an Indicator? Answer: Although Stachybotrys is black in color, so are many other types of mold. Do not assume you have Stachybotrys just because the mold is black. Below are a few examples of other types of mold besides Stachybotrys that can appear black in color. Do not make a common mistake and discount the importance of other types of mold that you may find simply because the mold you see is not black. Bottom line: Don’t let the color of mold be an indicator of potential hazard level. • Did you know that the same mold can be different colors depending on what it is growing on? Below are two examples of how the same mold looks visibly different depending on what substrate it is growing on. Color is used by laboratories as a diagnostic tool under controlled conditions such as temperature, light/dark and various types of petri dish agar. Q: What is a Mycotoxin? Answer: Mycotoxin is the toxin produced by mold, and there are many types of mycotoxins. The toxin produced by mold is a by-product generated as the mold metabolizes nutrients. Mycotoxins are volatile organic chemical compounds. Trichothecene is the name of the toxin that Stachybotrys can produce under certain conditions. Mycotoxins in general are very long chemical chains and tend to remain chemically stable for many years. Now with that being said, NOT all molds produce toxins; And even if the type of mold you have is reported to be a potential toxin producer, it doesn’t mean all the mold you have is actually producing toxin or all the mold spores of that mold are toxin producers. Q: What if you find out you have Stachybotrys? You can effectively “kill” the mold using a variety of products and if you kill it you will prevent it from growing in a new location if a spore happens to land in a moist area. However, regardless of if you decide to kill the mold or not, the mold should be REMOVED from the premises. ***Please note that using bleach is no longer the recommended method to clean mold. Simple detergent is preferred. For contaminated materials that are not a hard surface like metal or plastic and are on porous materials such as textiles, wood, sheetrock etc. They may need to be replaced depending on the situation. (7) These materials are absorbent and the roots of the mold can grow down into the microscopic holes of the material and make cleaning difficult. After all contaminated materials have be cleaned or removed, wipe all horizontal surfaces to eliminate as much organic settled debris as possible. Remove the spores from the air: HEPA filters remove the particles in the air i.e. spores, pollen, skin, etc. There is no practical way to eliminate all mold and mold spores in the indoor environment (7) Mold is a part of our natural environment, and an important one for many reasons. Your indoor air environment mold spore concentrations should be similar to or lower than the outdoor mold spore concentrations. Remember that doors and windows are regularly opening and closing, and people are constantly moving in and out of the interior spaces, therefore air flow is in constant motion. For this reason, mold spore concentrations are also constantly changing and sampling provides a snap shot of the air at the precise moment of testing. Multiple variables have to taken in to consideration when interpreting indoor air quality sample reports. Remove possible Mycotoxins from the air: To clean the air of any volatile organic compounds such as mycotoxins, use activated charcoal filters. The activated charcoal/carbon filter works to alter the length of the chemical compound’s chain. The amount of charcoal filter material needed to sufficiently clean an area will depend on the size of the area, and the length of time the air is filtered through the system. Please refer to the air purifier’s manufacturer recommendations for specific instructions. Macrocyclic trichothecene toxins produced by Stachybotrys atra strains isolated in Middle Europe. A Bata, B Harrach, K Ujszászi, A Kis-Tamás, and R Lásztity, Appl Environ Microbiol. 1985 March; 49(3): 678–681.